Emily Hunsinger eagerly watched as two of her friends hopped on red tricycles. The boys began to race around and Emily excitedly realized that for the first time, she can take part in the fun, too. 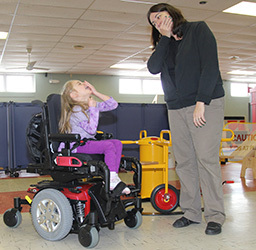 She moved the joystick on her new pediatric Q6 Edge® Power Chair from Quantum Rehab® and took off after them. Emily, 6, of McAdoo, Pa., has cerebral palsy and congenital deafness, though she has some hearing ability due to a cochlear implant. Emily is unable to walk or talk and communicates using American Sign Language. Emily's physical therapist, Sue Barry, recently started having Emily use a power chair, which is a pediatric Q6 Edge Power Chair in Pearl Pink. "She's now kind of got the concept that it gives her some power," Barry said of Emily using her power chair. "Whenever I ask her if she wants the chair, she always signs 'Drive.' I think she is really starting to realize what she can do with the chair. She is very excited to go in it and be able to be up and be on the level with the kids rather than try to crawl on the floor." Barry said Emily needs an adult with her one-on-one for safety at this point, so she trained a nurse to use the chair with Emily, and an occupational therapist will also use it with her. 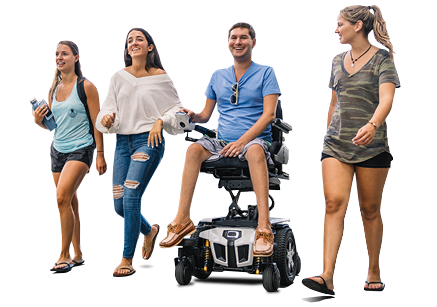 Barry's goal is to get Emily using her power chair for transitioning once she becomes a little more stable with it and consistent with her steering. "I would really like her to use it in transitions because she has to transition down the hallway to the elevator, come downstairs during gross motor play, during and after gross motor play, and when she transitions for her therapies," Barry said. "It would give her a lot of independence to not be pushed in a stroller, but to be able to drive to all of those things." Barry said Emily comes from a very active family, and her parents are looking forward to Emily using her power chair. "Emily and her family partake in a lot of outdoor activities," Barry said. "They're very excited for this summer to take her to parks, hiking, and her ability to have some control on her own rather than be carried or pushed." With an eagerness to learn and an infectious laugh and smile, Emily is discovering everything she can do by using her power chair. Instead of watching other children move about freely and play, she can now participate. "I've enjoyed watching Emily go from 'What is this?' with her power chair to seeing her interact with all of the kids," Barry said. "She always wants to be a part of everything. Her drive in life is to be where the action is. 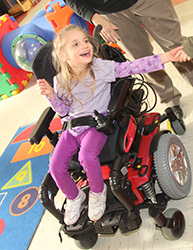 And with her Q6 Edge Power Chair, she can be part of the action."